Build on the brand WERTIOO and thus on clever and practical innovations. All WERTIOO products are subject to comprehensive and rigorous quality controls: from the first sample to the serial product. Convince yourself of WERTIOO, the strong brand in the household! Decorate your Garden, beautify your living room, dining room, bedroom, patio,everywhere! Also ideal for wedding, party, Valentine's day, and Christmas Eve. Automatic cycling timer (6 hours on, 18 hours off over each 24 hour period). Press DIM- or press DIM+ of remote control to adjust the brightness of the lights. IP65 Waterproof Rating, can be used for outdoor. Please place where children can not touch. Battery case and globe string lights are waterproof, can be used indoors and outdoors, but the controller is not waterproof, please keep the controller away from water and rain. [IP65 Waterproof]Waterproof feature works for all parts and in all conditions, avoid placing the battery pack under water can make it more endurable. 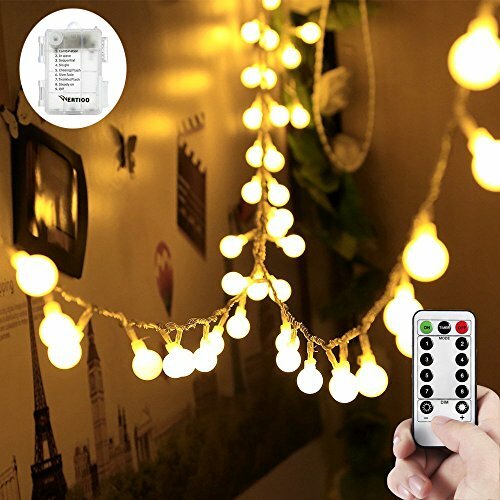 [Low Energy Consumption & NO Over-heat problems] this battery operated string lights is 4.5V 3000K color temperature. It requires AA battery(Not Included). The ball keeps at a low temperature so they are safe to touch without risk of burns after many hours of use.The LED Starry Lights are safe for children and pets. [Wonderful decoration] for your home and garden,Christmas tree,Halloween decor.You will find this light perfect ornament for your holiday, wedding, party and Christmas gathering. 100 LEDs globe warm white string lights creates a joyful and festive ambiance to your family and your friends.